"You've got 'The Look': the gaiters, the bandana, the hair . . . "
I was running the out-and-back section of the Triple C Trail a couple hours into the Sunmart 50K when one of the men in the 50-miler, who was walking up a hill as I was running down toward him, made the remark above. I don't know if he was trying to be funny, friendly, sarcastic, or what, but my response was a non-verbal, "Huh?" After all, I was running and couldn't quiz someone going the other direction and already out of earshot. When I run I dress for function, not fashion. Same with every other hour of the day, for that matter. I haven't been concerned with what's trendy since I was in my 20s. Comfort and durability are important to me. Sure, I like my colors to coordinate in a pleasing manner (so does Jim) but following fashion whims? Please. So is that "the look?" Sensible gray-green trail shorts that don't show dirt, white singlet and running bra to stay cool in the warm Texas sun, faded blue Cool Off bandana to wipe sweat from my eyes, faded, whisper-light blue-and-black Dirty Girl gaiters to keep grit out of my shoes, dusty gray Montrail Highline shoes that haven't been produced for a couple of years (doggone it), sweatband and visor to keep sweat, sun, and long, curly hair out of my eyes, and a single-bottle fanny pack with two pockets attached to the front to hold my camera, gel, and electrolytes. Yep, that's "the look" for me when I run trails: totally functional. Come to think of it, maybe that guy wasn't an idiot who was being sarcastic, but was complimenting me because he could tell I'm a trail veteran. In that case, oops and thank you to whoever-you-were. I'm sorry I couldn't get a shot of him at the finish, too, but he was almost two hours ahead of me. If you read all that closely enough, you know we both finished the race. Keep reading if you're interested in the details and more photos. 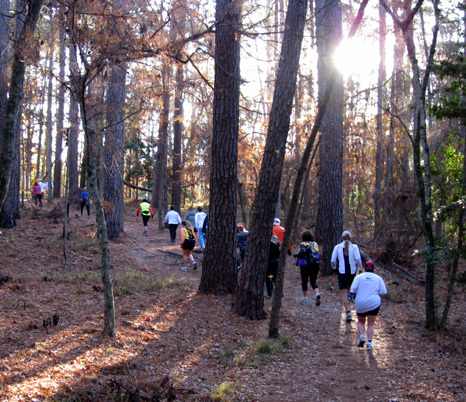 The 19th annual Sunmart 50-miler began at 7 this morning at Huntsville State Park with about 200 runners. but we chose to sleep an extra 45 minutes in our camper, eat familiar pre-race foods, and walk two-thirds of a mile to the start/finish area as late as possible before the start of our race. 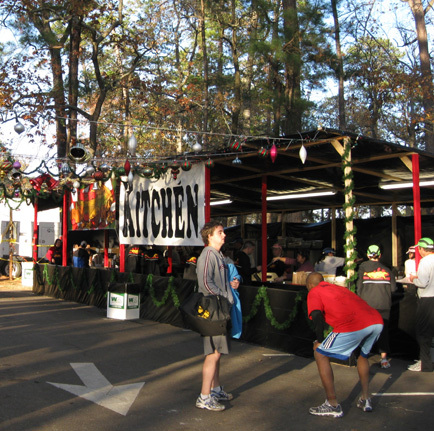 That served as a nice warm-up and gave us time to put our drop boxes on a picnic table near the official bag drop area (a mistake) before we got in line for the 50K race start at 7:45 AM. 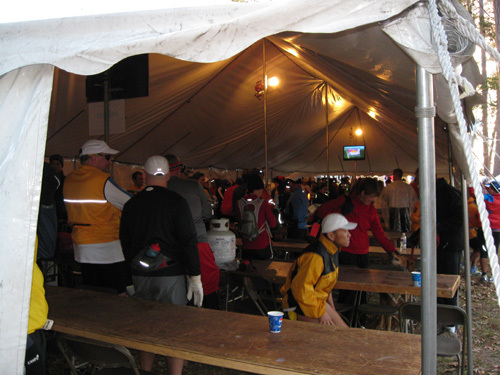 About five hundred 50K runners plus families and friends who came to crew for them were milling around the tents making last-minute race preparations, socializing with friends, and trying to stay warm. Although the sun had already risen when we reached the start, strings of white Christmas lights were still twinkling a festive welcome. 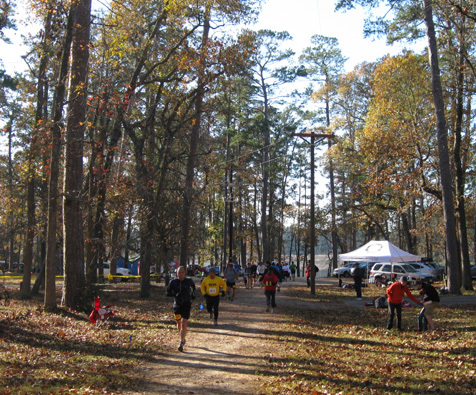 The last two hundred yards of the course were lined with running clubs' and runners' canopies, similar to the Rocky Raccoon 50- and 100-mile races. It was fun each loop to run through the canopy area to the cheers of spectators. Since we were running only the 50K and had no crew, Jim and I didn't set up a table, chair, or canopy. If we run this race again we need to re-think where to put our drop boxes so they are more convenient to the trail. We both lost time during the race going out of our way to the official bag drop area, which was not very accessible from the course during the race. Both of us lined up near the back of the pack. Our intention was to walk all or most of the first mile to thoroughly warm up, then start running. That worked fine for me but it may have cost Jim some time. Although some hardy and/or fast runners started off in shorts and singlets most of us had on more clothing for the first loop. I warm up quickly even when I'm walking; I had my gloves off in a couple miles but pants and long sleeves felt good the first couple hours at the snail's pace I was going. 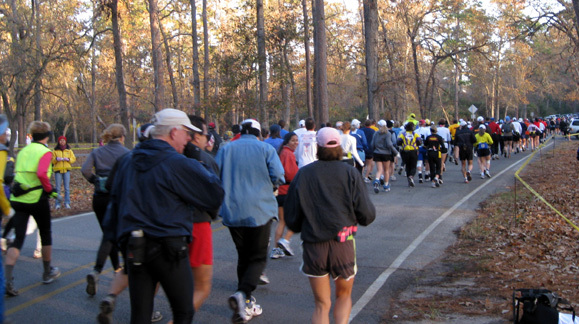 Because there are so many runners in the 50K race the course follows the park's main paved road for the first mile. On subsequent loops we used the single-track Dogwood Trail paralleling the road to go in and out from the start/finish area. It was very crowded with runners from both races my first time in and out but not bad the next two times. Jim (in foreground in photo above) stayed with me most of the first mile on the road. I kept telling him to go at his faster walking pace but he was content to stay near the back of the pack. 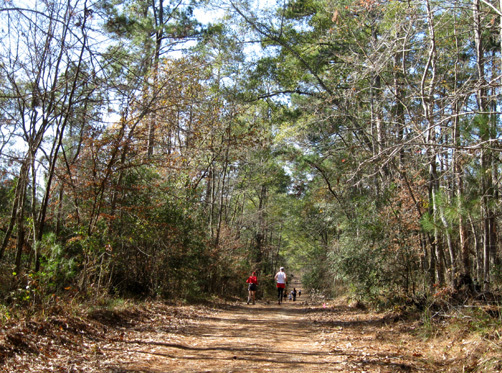 He finally started running as we reached the Nature Center and turned off onto the single-track Chinquapin Trail. He soon wished he'd gotten in with a faster group of runners on the road. At that point there were only about two dozen people walking behind us. The narrow trail was so clogged with runners ahead of us that it was stop and go for a quarter mile or more -- even if someone like Jim was ready to run. He was more frustrated with that than I was. I knew I had plenty of time and might walk the entire race. I just chilled out, enjoying the fresh early morning sights, sounds, and smells in the woods as I talked with one of the runners Jim and I had noticed on the road. I never did get her name although we saw each other several times during the race. In the photo above she's the woman wearing the white tights, which she kept on the entire race. That was good because it helped me remember who she was. If I don't see other runners' faces clearly when we're side-by-side in a race, I often don't recognize them later when they've taken off or put on some clothes. 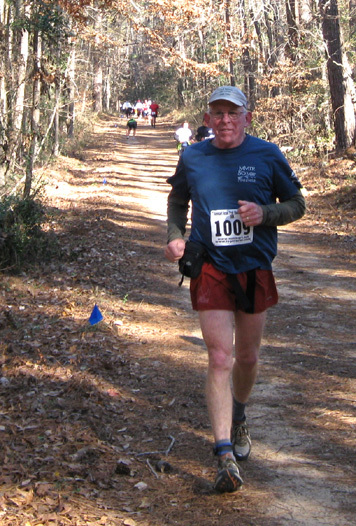 Jim was able to pass quite a few people on the narrow Chinquapin Trail in the second mile of the race but it took extra effort. 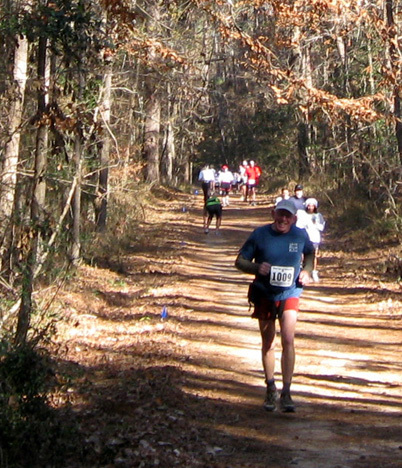 I started running the smoother downhill sections once the "train" of runners I was in began a slow run. And I promptly tripped over a root! That's one. I fell a second time later in the race when I was walking and not paying attention on the Triple C Trail. I was too busy talking with a couple as we climbed up a hill. I'm glad I wasn't wearing road shoes like many of the other runners. My Montrail Highline trail shoes are fairly light but have grippy traction and a sturdy rubber "bumper" on the toes. I stubbed my toes into lots of roots during the race but had no bruising. I'm also glad I wore my gaiters. The trails at Huntsville State Park were very sandy-dusty despite some rain earlier in the week and there is a lot of pine needle and leaf debris. I never had to dump debris from my shoes during the race. The only time Jim and I were together in the race was the first mile. He got ahead of me in the second mile on the Chinquapin Trail and steadily increased his lead once he hit the wider Triple C Trail 2+ miles into the race. 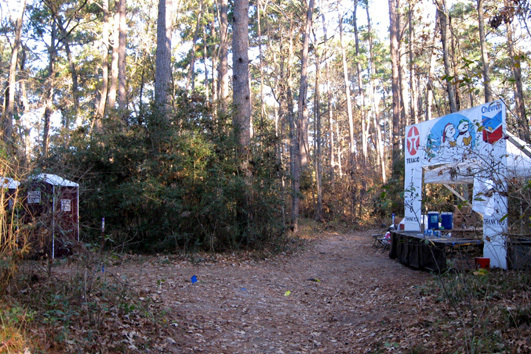 That was the location for the busiest aid station in the race; 50K runners pass it five times and 50-milers ten times. The aid station was crowded the first three times I passed it. I was glad I could just keep on going. I had a fueling plan that allowed me to bypass more than half of the aid stations during the race, saving me some time. I didn't stop at either aid station on the first 6.7-mile loop. I was carrying a bottle with concentrated Perpetuem in my hand and had water in a bottle in my fanny pack to wash it (the Perp) down. That works better for me than carrying Perp mixed at regular strength. I also carried a 5-oz. plastic flask with Hammergel for additional calories. The only thing I got from aid stations was water to top my water bottle as needed and to mix up a new bottle of powdered Perp at the beginning of the second and third loops. I drank enough fluids and consumed enough electrolytes this time to avoid dehydration and cramping like I've had so many times before. Jim used a totally different fueling plan. He originally carried Heed in a bottle in his fanny pack but discovered he could easily get between the aid stations (which were situated no more than three miles apart) by drinking two cups of Heed at each aid station and occasionally grabbing some food. He ended up not needing to carry the bottle in his pack. Back to the first 50K loop . . . after passing the first aid station we ran on the wide Triple C Trail for about three miles around the eastern end of the park. Even though I could see runners ahead of me in this section we were spread out enough by now that our progress wasn't impeded until we hit the two-way runner traffic a mile from the start/finish/turn-around area at the lodge. 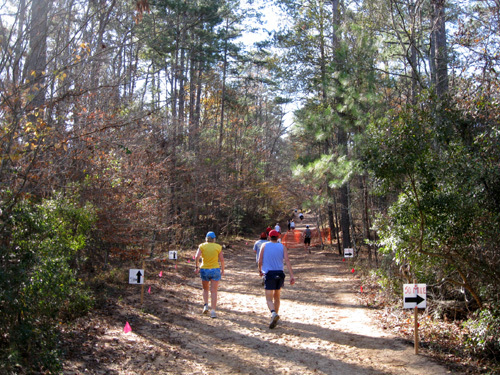 50K runners had the Triple C Trail to themselves on the first loop. The next two loops there was two-way traffic here. 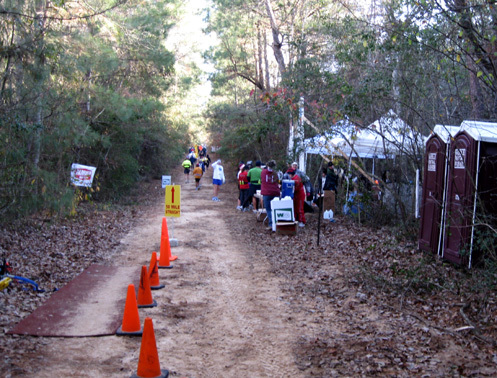 Fifty-mile runners always turned around about a mile into the Triple C Trail and came back past the first and second aid stations. They had all passed through here on their first long loop when the 50K runners reached this trail -- so it was just us heading toward the second aid station this early in the race. This time the 50Kers ran over the timing mats and kept on going straight. We didn't see any of the 50-milers for another three miles. Neither Jim nor I cared much for this section but it was fun to see the other 50K and 50-mile runners on our second two loops. We also saw them three times on the mile-long out-and-back section of the Dogwood Trail near the start/finish area. It was also great that Jim and I could say hi, give each other some encouragement (and/or a hug! ), and see how far apart we were. I saw Jim for the first time on the narrow, very crowded Dogwood Trail (below) as I was heading toward the start/finish area. I was about six miles into the race and he was already more than a mile ahead of me. I didn't see him enough in advance to get his picture. At the end of our first loop Jim and I each wound through runners' canopies to reach our drop boxes and take off some clothes. 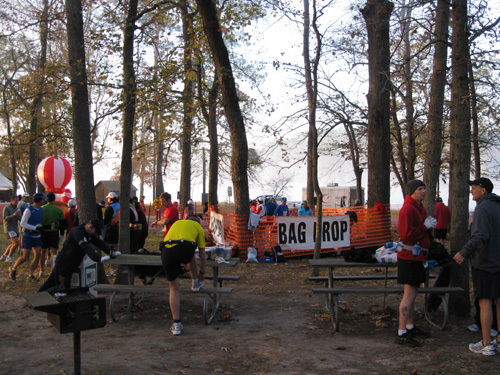 Once the race started there was no direct route to the bag drop area from the course, to our surprise. I mixed up a fresh bottle of concentrated Perpetuem and refilled my water bottle at the aid station, then headed out for a longer loop of 12+ miles. I don't remember my time, but I was pleased with it because I'd been able to run more than I planned. 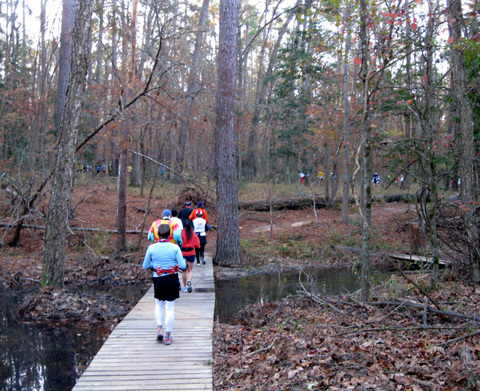 On my way back out the Dogwood Trail to the Chinquapin Trail, I could see most of the 50K runners who were behind me. It was reassuring to know that I had gained on some runners I passed during the first loop. I wasn't in competition with them and wished them no harm; I was just happy that I wasn't last, as slowly as I was going! Both of us ran well on the second loop, which was almost double the length of the first loop. Jim felt really good and stuck to his intended pace through the first two loops (19+ miles). Based on several discussions we had about pacing, I thought he was going to run and walk at the pace he plans to go the first twelve hours at the 48-hour ATY race in three weeks. I didn't know until after the race that he changed his mind while running and decided to aim for his 1999 Sunmart splits which resulted in a time of 5:38. That's a 10:46/mile pace -- much faster than he better be going the first twelve hours at ATY! The second picture I took of him at this location is near the top of this entry. The first nine miles of this loop (i.e., through about sixteen miles of the race) I was easily running the smooth downhill and flat parts of the trails and walking as fast as I could uphill. Down to singlet and shorts, I stayed comfortable in the mid-60 degree F. sunshine. 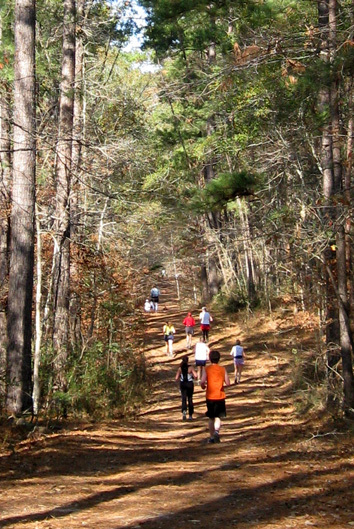 Much of the course is shaded by the tall loblolly pines that dominate the park. Perpetuem and Hammergel provided all the calories I needed to maintain my energy and I felt absolutely wonderful running in the woods all morning. 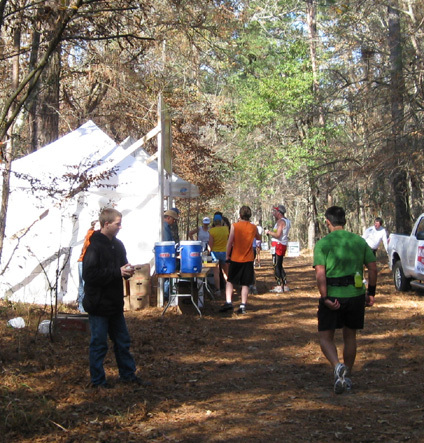 The second and third 50K loops went outbound on the Dogwood Trail to the Chinquapin Trail, then south to the first aid station again and out to the timing mats on the Triple C Trail at the second aid station. Instead of continuing forward, we turned around here and went back to the first aid station. We followed this wide trail for several miles around the southern and western perimeter of the park. The 50-milers were not on this section with us; they ran somewhat parallel to us on the portion of the Chinquapin Trail west of Lake Raven. In the photo above you can see where the 50K runners are directed left to remain on the Triple C Trail and the 50-milers turn right onto the Chinquapin Trail. 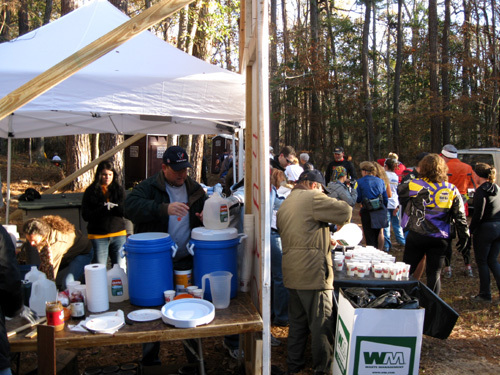 Soon after this aid station the Triple C Trail morphed into single-track for a couple miles until merging with the Chinquapin Trail at the northern end of the lake. This is the headwaters of Raven Lake, with long sections of boardwalk crossing the wetlands. 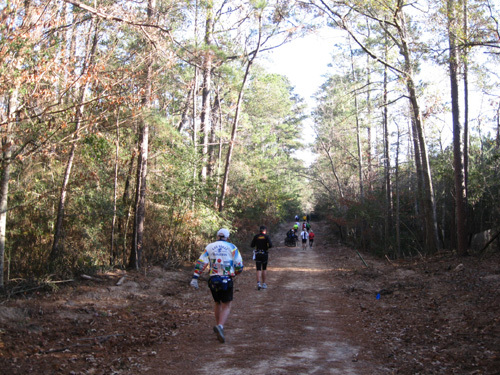 Then the 50K and 50-mile runners shared the course the remaining four or five miles back to the start/finish area. 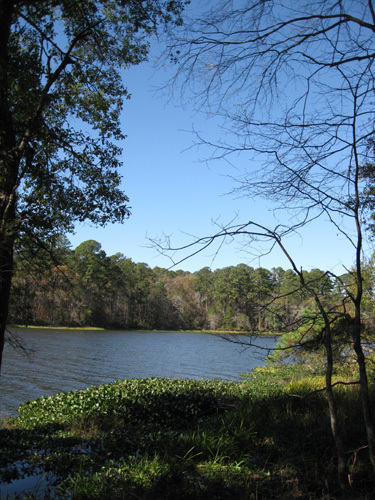 My favorite section of trail in Huntsville SP is the lower part of the Prairie Branch Loop Trail. It's not as runnable for me as the rest of the course because of all the roots and bog boards but the scenic beauty and waterfowl sightings are a great distraction! The fourth and last aid station was located at the "bottom" (south) end of the Prairie Branch Loop. That's also where we were camped. Since my race time wasn't as important to me as Jim's was to him, I agreed to run down about 200 feet to our camper to tend to Cody on the second and third loops. The trail was roped off in that direction to keep runners going UP the trail instead of down it when they left the aid station. I had to explain to two volunteers what I was doing the first time, giving them my name and number and promising that I'd return to the course in a few minutes. When I got done walking Cody and returned to the aid station, the radio guy told me he'd called the finish area for "permission." That was AFTER I'd already run down to the camper! I was doing bonus mileage, not cutting the course. 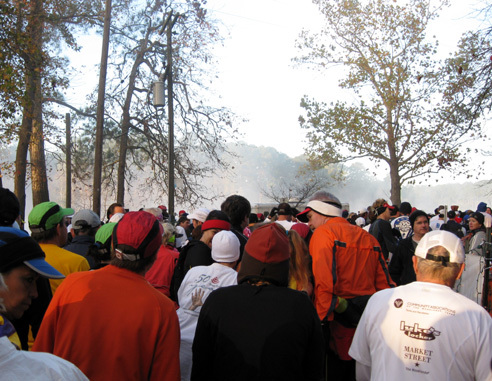 It was no different than runners going off the course at the start/finish area to get to their canopies, tents, or drop bags. There certainly wasn't anyone monitoring that. Aid Station #4 the day after the race. Runners approached from the left (lake side) and made a left up the hill. I went downhill (foreground) to our camper two times to tend to Cody and return to the aid station. Cody was very happy to see me after we'd been gone over four hours. He pottied, rolled around in the pine needles, and happily returned to the camper to sleep some more. Previously we've left him for as long as eight or nine hours in the camper and he's done fine. 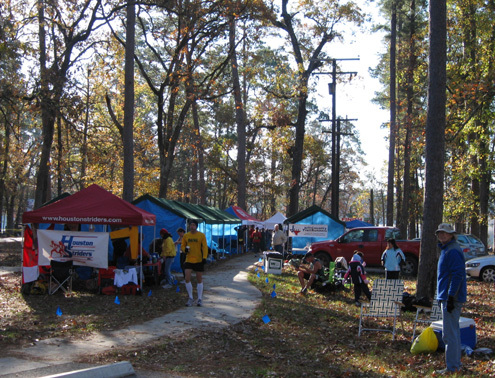 It was a little bit over four hours into the race (not quite noon) when I returned to the course; I was at the camper 7-8 minutes. 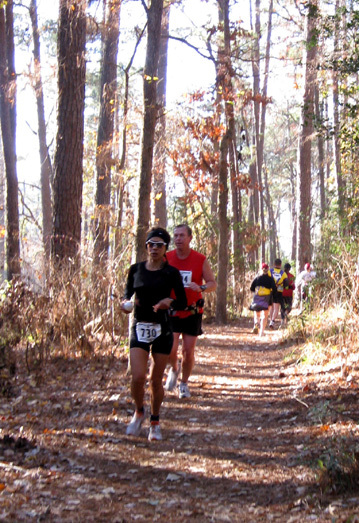 I had been easily running the smooth downhill and flat sections of the course from the second to the sixteenth mile, which pleased me a lot since I started this race not knowing if I should try to run at all. I walked up the hill past the aid station on the upper Prairie Branch Loop and ended up walking most of the rest of the race. My hamstring was doing fine but my knees were starting to get sore from all the downhill running and I didn't want to push my luck with either body part. I was happy to finish 19+ miles in 4:41 hours. I knew I had plenty of time to walk the last 12+ miles and finish before dark. Runners leave the start/finish area to begin another loop. Jim finished that loop in about 3:50, which means he was already three miles ahead of me when I was at the camper. That's about the same time he ran 19 miles at the 1999 Sunmart 50K. Could he sustain that pace the third loop?? Loop 3 was identical to Loop 2 but if you've ever run a loop course, you know the hills get steeper and the miles get longer after you've been out there for a while! I think I had more fun on my third loop than Jim did. Although I had the energy to run I was happy to just walk to protect my knees and hamstring. I felt no time pressure, which was a treat -- so different from my last race. I could socialize more with other runners who were walking (unless they were too tired or demoralized to chat) and I could observe my surroundings more closely. The weather was perfectly sunny and warm, the trails were dry, the birds were singing, and I could hear wildlife scampering in the forest as I approached their territory. Triple C Trail on Loop 2; by Loop 3, we were spread out farther. I even saw my first armadillo-in-the-wild (as opposed to confined or road kill) on this last loop. I would have missed seeing it if I'd been running. It was gone before I could get a photo. I was surprised at the number of people I passed while walking the last fifteen miles. I was able to maintain a very brisk pace (for me) until the end of the race. That got me thinking more about walking all or most of the ATY 24-hour race in three weeks. It may be the best way for me to avoid hamstring, blister, and cramping problems and stay on the track the entire time. When I was coming into the last aid station near our camper I could hear what sounded like our truck being started. I soon discovered it was Jim but by the time I got down there he was gone. (I had to go through the Trail Nazi again for permission to leave the trail.) Jim had already finished the race, grabbed some food at the post-race BBQ, and walked back to the camper to see if I'd fed Cody yet. He could tell I hadn't been back the second time yet so he fed Cody and drove back to the finish area with him to wait for me. Jim left me a note to call him when I got to the camper. He was happy to hear I'd be finishing soon and I was glad he had a good race. I estimated it would take me 50 minutes to walk the remaining three miles. I returned to the aid station and continued on the Chinquapin Trail. About two miles from the end a chatty woman ten years younger than me caught up and asked if she could walk with me to the end. She was still able to run but preferred to talk! She wasn't in any hurry because the friends she'd ridden with to the race were well behind us. I was also glad for the company because it made the time go faster. I was still able to maintain a brisk walking pace at that point, but my knees hurt too much to want to run. There just was no point to it. 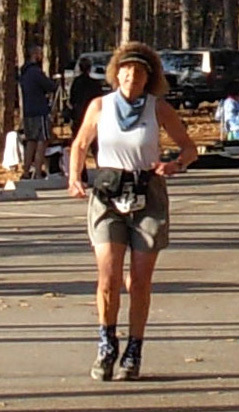 As we entered the "gauntlet" of runners and their canopies, I suggested Nancy run ahead to the finish line. Several spectators encouraged me to run, too. My response was that I had one speed left, and this was it! I continued my brisk walk. The official race photographer is sitting on the ground taking pictures. A rep from Nestle Co. is on the left in the goofy outfit (the bottles of chocolate Nesquik sure tasted good at the end). I cropped in closely to get the photo of myself at the top of this entry. I figure I could have finished the race in a little less than eight hours at the running/walking pace I was going if I hadn't stopped at the camper twice, gone out of my way to get to my drop box twice, and taken four dozen photos! That would have improved my pace from 16:17 per mile to about 15:20 per mile. I would be tickled pink with a 16-minute average at ATY over 24 hours -- that would give me the 90 miles I originally set as my goal; I've lowered that goal since my hamstring injury, however. Jim ran a comfortable race and finished strong. Jim finished in 6:36, slower than he was hoping for when he saw how well he was doing at the end of the second loop, but a good time for the training he had -- and a pace more like the one he should be doing his first twelve hours at ATY. He had absolutely no problems during the race, just slowed down the third loop from fatigue. 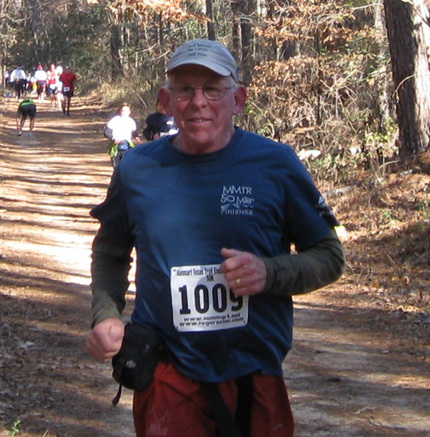 Jim placed 11th out of 19 men in the 60-64 year age group and 233rd overall out of 279 male finishers. The slowest man in his age group finished in 11:10 hours, which was also the overall slowest finishing time this year (he had only five minutes to spare on the cut-off). The M60-69 course record is a quick 4:25. 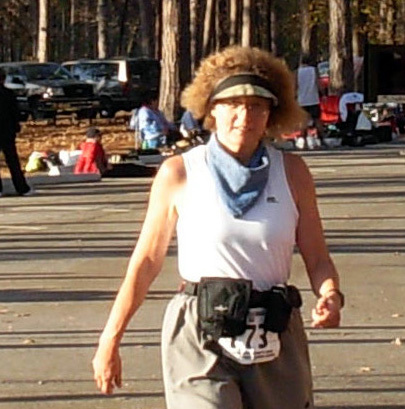 I finished 7th of 9 women in the 55-59 year age group and 174th of 203 female 50K finishers. I'm almost 60. In the 60-64 year female age group, I would have placed a little worse (7th of 8 finishers)! The slowest woman in the F55-9 AG finished in 9:54. The F50-59 course record is 4:16, the F60-69 record 5:33. That gives me something to shoot for next year . . . yeah, right! Happy to be done. Now, can I do another long run tomorrow for a double? 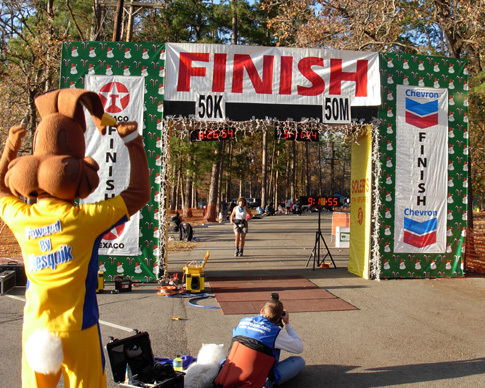 According to the results on Roger Soler's web site, there were 482 finishers in the 50K (279 men, 203 women). Kelly Mortenson was first overall in 3:21; Wendy Terris was first female in 3:53. These times were well off the course records of 3:07 (Ulrich Steidl) and 3:35 (Liza Hunter-Galvan), respectively. One hundred sixty runners finished the 50-miler (112 men, 48 women). The overall winner, Matthew Lonergan, finished in 5:56; Donna Palisca was first female in 7:10. Course records are 5:20 (Charl Mattheus) and 6:14 (Ann Trason). You can see all the results in both races at the web site link above, as well as results from recent years. Jim had almost two hours to kill after he finished the race, waiting for me to come in. He picked up his finishers' medal and silky sueded microfiber jacket with hood, ate some food, and went to the camper to see if I'd been there yet to feed Cody. He also thought to get a camera so he could catch me at the finish line, which was a nice surprise for me! I forgot to suggest it to him when I talked to him just after he left the camper with Cody. 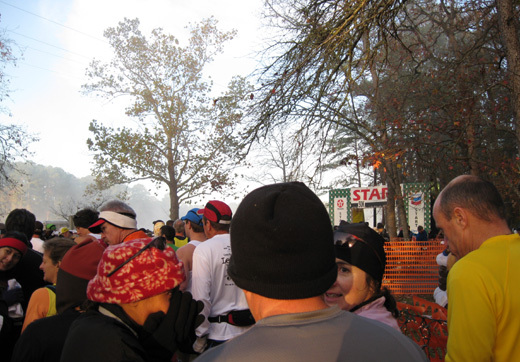 Although I felt strong throughout the whole race, I was mighty glad to chug down some chocolate drink soon after finishing, go through the long food line (shown in photo above), and SIT DOWN! We found Georgia friend Tom Adair and had fun talking to him and meeting some other people he knows. There was still plenty of food left when I finished (probably half of the 50-milers were still out on the course, and a few dozen 50K runners). Those of us closer to the back than the front really appreciate that. Too often the good stuff is gone when slower runners finish or there aren't any finishers' garments left in our size. Thank you, Sunmart folks. I wasn't very hungry but the wide variety of grilled and BBQ'd foods looked tasty. I was plenty warm when I was running and walking during the race but I get chilled pretty quickly when I stop moving after a race. As soon as I got cold we decided to return to the camper. Ohhh, was I stiff! I was glad I had to walk only a hundred yards to the truck and not another two-thirds mile back to the camper. We both slept well after the race, happy with our results even though our races don't look all that impressive to anyone else.